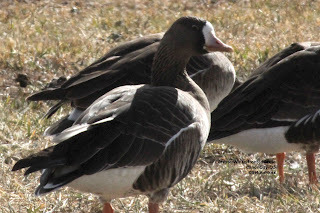 These are a few of the 13 Greater White-fronted Geese that have spent the winter in Canon City, CO. Every winter for more than 15 years now a flock of Greater White-fronted Geese, from 7 to 13 birds, have migrated south to Canon City from their high arctic breeding area and overwintered here. Most of this species that spend the winter inland do so along the Gulf Coast in Texas and Louisiana. Canon City has demonstrated it is mild enough to support overwintering of small numbers of birds that normally winter further south. Birds of North America online notes that the immature birds remain with their parents not only for their first year but for several years. So the birds that winter here are likely parents and several generations of their offspring. They will likely be leaving soon to fly back to their breeding territory.